October 04, 2017, 8:50 p.m.
Hurricane Maria is different: while Americans praised the response to and preparation for the two hurricanes which devastated parts of Texas and Florida in August and September, they had much less positive things to say in the latest Economist/YouGov Poll about how local and national governments and the President handled Hurricane Maria’s impact on Puerto Rico. 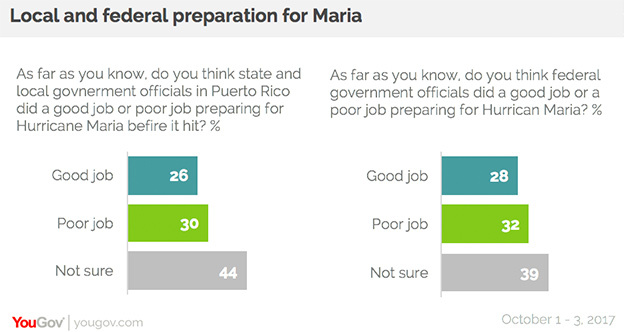 Americans’ assessment of government action in the response to Maria clearly is political. In September, about as many Democrats had positive as negative things to say about the government’s hurricane-related actions. Now, neither Democrats nor independents give the government good marks for its response to the latest storm. Republicans, on the other hand, are positive. 64% of Republicans say the government’s response was adequate, and 60% say it acted as quickly as it could. The government of Puerto Rico is not immune from criticism. The public is closely divided, though on balance negative, about the island’s preparation for the storm. 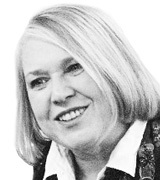 A narrow plurality also thinks the federal government could have done better. Republicans are more likely to criticize the Puerto Rican government’s preparation; Democrats are more likely to criticize the federal government. In September, both state and national governments were viewed as having prepared well for those storms. The President does not escape criticism for his handling of Hurricane Maria, a clear change from the assessment of his actions after Hurricanes Harvey and Irma. Twice as many approved as disapproved of his management of the earlier storms; when it comes to the more powerful Hurricane Maria, the public narrowly disapproves. While that may change after his Tuesday visit to the U.S. island commonwealth, it differs dramatically from the earlier public response to the President’s handling of the other hurricanes on the U.S. mainland. 52% believe the President cares at least somewhat about those affected by Hurricane Maria. That is nine points lower than the 61% who said that he cared at least somewhat about the victims of Hurricanes Harvey and Irma. 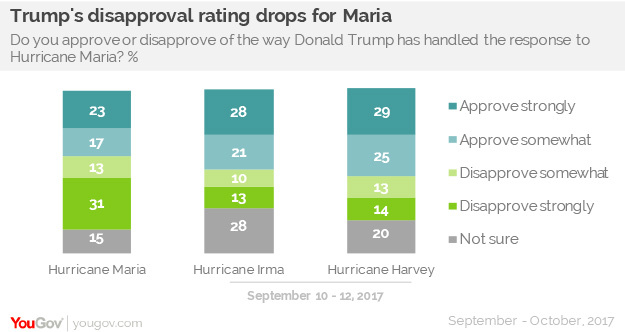 One reason for the more negative public assessment of the President after Maria may be the negative ratings of his public statements. In the YouGov Tweetindex, a majority describes his September 30 tweets criticizing the Mayor of San Juan as “bad” or even “terrible.” And those tweets score in the lowest 4% of the nearly 1,300 Trump tweets evaluated since February 4 by the YouGov panel. Nearly all of the President’s lowest-rated tweets are those that attack political opponents, the news media, or other individuals. 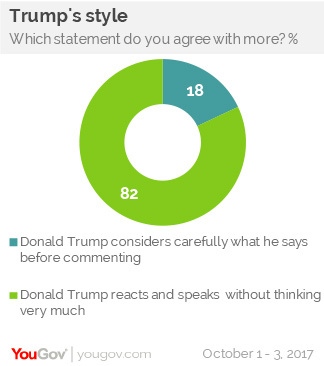 In the current poll, 82% believe the President doesn’t think much before he speaks – even higher than the percentage saying this in previous polls. Two in three Republicans agree. 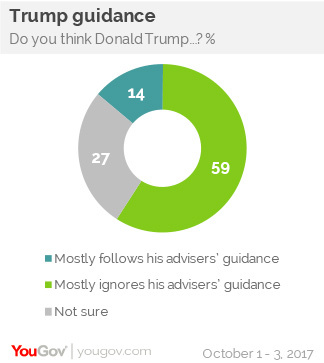 And nearly six in ten say he ignores guidance from his advisers. The President’s overall approval rating has changed little in the last few months. This week, 39% approve of how Donald Trump is handling his job as President and 54% disapprove.